beatmania IIDX 21 SPADA logo. SPADA 同时也是 beatmania IIDX系列自从beatmania IIDX 17 SIRIUS以来第二次使用全大写名字的作品. SPADA is the first game since Resort Anthem where its first location test was not held on the month of April consecutively. It is also the first game to have its location test for more than a year after the last one (tricoro on April 2012), instead of the usual 10-12 month interval between games after 8th style. 默认念白为男性的声音. 如果e-AMUSEMENT PASS输错密码的话念白会有负面回应. 念白声优为Project B-. The feature saves the specific chart of a song. You can still select difficulties of the favorited song in the category folder. You cannot register more than 20 different songs. 在选择游戏模式之前仍然会出现选择SP/DP的画面 This is the only way to activate the RIVAL setting of the respective play mode, as switching SINGLE and DOUBLE in the song menu screen will not switch SP/DP Rival settings. Logos of beatmania IIDX games appear next to the genres of their respective songs. Titles of the new songs are written with a violet font. Mode type (Single/Double), difficulty name and difficulty rating are displayed below the Rank. COMBO BREAKS are now counted. Amount of FAST/SLOW notifiers gathered in a song is now always displayed, instead of being a hidden viewable feature. If you fail a song by either depleting your gauge under a HARD/EX-HARD GAUGE or by missing more than a specific number of notes in a row without hitting any buttons, the chart measure and note numbers where you have lost will be shown. According to the official beatmania IIDX 21 SPADA site, this feature is called the "DEAD POINT". Total Notes information are now shown again in the result screen. Normal score is not shown anymore. The Score Gauge, which is always seen in the game menu, now too appears in the ranking section for each player. The bar of the Score Gauge appears with different colors, depending on which RANK is obtained and by FULL COMBOs. Stage phase shown on the top of the screen has now a much bigger font. The difficulty level of the song is now shown next to the difficulty name. The Groove gauge appears closer to the buttons/scratch lane. Max Combo, Score and BPM information are now correctly arranged when the score graph is turned off. Max Combo and Score information are arranged on the top layer when the score graph is turned on. Stage information appears in the middle of the top layer. In the DOUBLE PLAYER gameplay UI, Hi-SPEED and Difficulty information have switched place with the Max Combo and Score information. Songs with overlays from Lincle and older now have their movie windows cropped to fit the proper dimensions instead of having black bars at the sides. When beatmania IIDX 21 SPADA was released, songs did not have result screen art. These were added on December 11th, 2013. Difficulty selection in STEP UP mode is strictly tied to your DAN rank now. All the hidden songs from tricoro's exclusive events, including revivals, are not already unlocked in SPADA. If you didn't unlock them in tricoro, you have to unlock them in SPADA. They're progressively unlocked with Tran Medals, up to 152 of them. All the songs can be now quickly unlocked throughout the ongoing 発見！よみがえったBEMANI遺跡 event. The Café de Tran, Shiritsu BEMANI gakuen, and Q-pro, Mimi, Nyami & Pastel-kun no Minna de Uchuu Sensou!! songs can also be unlocked throughout the aforementioned event. The Lincle Link 5 event ended on May 14th, 2014. The songs, including the Lincle Link 1 ones, are instantly unlocked if an eAMUSEMENT PASS is used. First beatmania IIDX game since Tatsh's return in Resort Anthem where he doesn't appear in a game's new songlist. First beatmania IIDX since their debuts that Seiya Murai and Qrispy Joybox don't appear in a game's new songlist. First beatmania IIDX arcade game since Ryu☆'s debut where he doesn't compose any new songs for the game under his primary alias. First beatmania IIDX game since EMPRESS with no BEMANI crossovers on the new default songlist. First beatmania IIDX arcade game since HAPPY SKY to not revive any old beatmania IIDX songs. First beatmania IIDX game to have an unlock event, named Spada†leggendaria, with songs exclusively made by (mostly recent) commissioned artists. PASELI features, accessed throughout collectibles named V-Discs, have been added to STANDARD and STEPUP modes on April 23rd, 2014 for Japanese machines only. Coin users won't be able to access the EXTRA STAGE (and consequently, any of the Spada†leggendaria songs) and charts rated level 11 and 12 on STEPUP mode. For each PASELI play session, you obtain 7 V-Discs. 7 V-Discs are needed to simply access the EXTRA STAGE. If you reach the EXTRA STAGE, you can access the LEGGENDARIA folder which contains all the Spada†leggendaria songs on Phase 4 plus their exclusive †LEGGENDARIA charts. Selecting a song from this folder requires 6 V-Discs. 6 V-Discs can be used to avoid a Game Over. If you reach 100 V-Discs, the VIP PASS BLACK feature is automatically enabled. It allows you to always avoid Game Overs and the ability to play the same song over and over in a play session. With PASELI, you can use your final beatmania IIDX 20 tricoro scores as a pacemaker ghost. With PASELI, Dellars obtained from play sessions are multiplied by 1.5. Key sound volume is now lowered when two players are playing to make the song sound like intended. First beatmania IIDX game since 6th style not to feature a ONE MORE EXTRA STAGE. Songs with generic videos and no unique overlays no longer credit the original VJ on the official website pages for a song in the NEW SONGS category. This also carried over to PENDUAL's website as well. The Nettou! BEMANI Stadium (熱闘！BEMANIスタジアム) event is a collaboration event between beatmania IIDX 21 SPADA, DanceDanceRevolution (2013), GITADORA, pop'n music Sunny Park, jubeat saucer, REFLEC BEAT colette -All Seasons-, SOUND VOLTEX II -infinite infection-, DanceEvolution ARCADE and ミライダガッキ FutureTomTom Ver.2. For more information on the event, please see its page. Two licensed songs (which involve the VOCALOID GUMI) were added on June 26th, 2014 as default songs to beatmania IIDX 21 SPADA, DanceDanceRevolution (2014), GITADORA OverDrive, jubeat saucer fulfill, pop'n music ラピストリア, REFLEC BEAT groovin'!! and SOUND VOLTEX II -infinite infection-. The third KONAMI original song, Idola, can be unlocked. Its NORMAL, HYPER and ANOTHER charts are unlockable after playing 3, 6 and 10 credits respectively (you must unlock the charts on the event website though). The Hakken! Yomigaetta BEMANI iseki (発見！よみがえったBEMANI遺跡) event is a collaboration event between beatmania IIDX 21 SPADA, DanceDanceRevolution (2014), GITADORA OverDrive, jubeat saucer fulfill, REFLEC BEAT groovin'! !, SOUND VOLTEX II -infinite infection-, DanceEvolution ARCADE, ミライダガッキ FutureTomTom Ver.2, and BeatStream. For more information, see its page. ASSIST modifiers and Easy Clear gauge can be used. On Japanese machines, EXTRA STAGE is only accessible now to PASELI users from April 23rd, 2014. 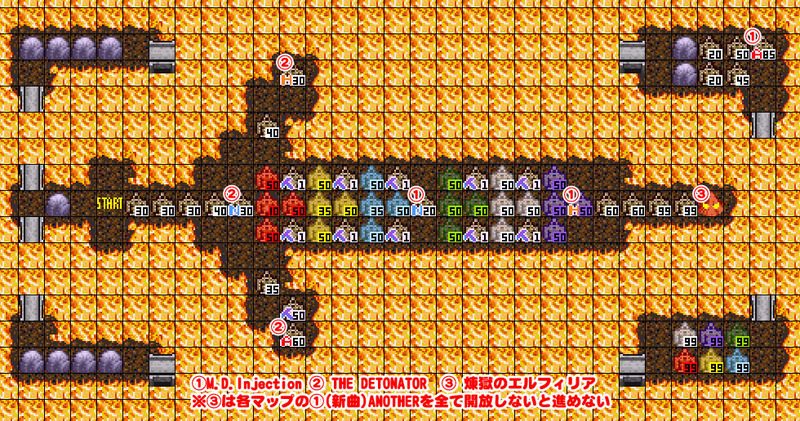 Spada†leggendaria (Italian for "legendary sword") is SPADA's secret EXTRA STAGE system, with each boss song related to a legendary sword from mythological and fantasy tales. The unlock method is based on the LIMIT BURST event from beatmania IIDX 20 tricoro. Each Spada†leggendaria song, in addition to requiring the EXTRA STAGE to be unlocked and a specific song to play as the FINAL STAGE, has different phases of unlock conditions. Each phase has a minimum total difficulty requriement and minimum clear status requirement, except the fourth phase. Phases for Spada†leggendaria songs, until the third one, cycle weekly. Fourth phase and the successive song are triggered in the first day of the successive month that isn't Saturday or Sunday. As of April 23rd, 2014, Spada†leggendaria songs require PASELI to be played, due to EXTRA STAGEs being unavailable to coin users. This is only true for Japanese machines. ANOTHER chart: Total difficulty of at least 33 and Full Combo Cleared. HYPER chart: Total difficulty of at least 27, Hard Cleared or above. ANOTHER chart: Total difficulty of at least 33, EX Hard Cleared or above. NORMAL chart: Total difficulty of at least 18, Assist Cleared or above. HYPER chart: Total difficulty of at least 27, Cleared or above. ANOTHER chart: Total difficulty of at least 33, Hard Cleared or above. Any chart: no difficulty requirements, Assist Cleared or above. Song becomes available in the LEGGENDARIA folder. Other than the original charts, †LEGGENDARIA charts are available on the LEGGENDARIA folder. These charts are harder versions of the ANOTHER charts, much like the BLACK ANOTHER charts. The LEGGENDARIA folder is only available by using six V-Discs (PASELI only). NOTE: Spada†leggendaria songs with the †LEGGENDARIA ANOTHER charts are separate from their original songs. Their titles are also written with a red font and have a background purple bar on the songwheel menu. WARNING: Failing any stage will prevent the Spada†leggendaria song from appearing, even if you have met the requirements for that song. Each Spada†leggendaria song has its own unique background result image when unlocked. The Qprogue unlock system, introduced on December 25th, 2013, is an after-play mini-game that involves defeating monsters to unlock new songs. It follows the events of ぼくらの宇宙戦争 (Our War of the Worlds) from beatmania IIDX 20 tricoro, where Q-pro finds itself in a hostile world after accidentally entering the Legend Cross portal. The Qprogue mini-game is accessible at the end of a play session, regardless of the chosen mode. It only shows up with one player. In Qprogue, you control your Q-pro character on a map by using the commands of the numerical keypad or the white and black buttons to move around, perform, or cancel an action. You are free to go anywhere until the time runs out or until the Start button is pressed. Your objective is to destroy the enemies and raid temples in order to proceed further in the maps, level up and find new weapon classes. To perform any special action, you need stamina, which is credit-based. One credit gives you 100 points of stamina, which is worth a full stamina bar (shown on the bottom right of the screen). You cannot have more than 10 stamina bars. Stamina obtained per credit increases of 5 points for every two Q-pro levels. The maximum level that can be reached is 28, while the maximum amount of stamina obtained per credit that can be reached is 165. You obtain 3 extra stamina bars if you access the Qprogue mini-game in DJ VIP PASS BLACK mode (PASELI only), other than the temporary ability of defeating enemies in one hit. To defeat enemies, you need to take their HP down to zero; their HP amounts exactly correspond to their shown levels. Damage dealt to enemies mainly depends on the level of your Q-pro. Using the correct weapon class in battle doesn't matter much, unless you need a damage boost against an enemy with a higher level than yours. If your Q-pro level is high enough, you can defeat most of the enemies in one hit regardless of the chosen weapon class. Attacks on enemies are rewarded with bonus Dellars. Traveler - Default class. Has no special uses. Once the Rainbow Knight class is obtained, you cannot use this anymore. Fighter - Deals bonus Fire damage. Knight - Deals bonus Earth damage. It is required for using pickaxes to break rocks. Viking - Deals bonus Water damage. It is required to cross bodies of water between docks. Archer - Deals Wind damage. Assassin - Deals Dark damage. Cleric - Deals Holy damage. Rainbow Knight - All elements. Deals 40 points of damage per hit. Obtained when you find all six Lithography items and replaces the Traveler class. Weapon classes start at Level 1 and can be levelled up to 4 (MAX) by using Fountains. Choose a weapon class, then use a fountain (can only be used once). As of Qprogue DX, you can only use the Lithography tablets to level up classes; unlike the Fountains, these items raise to Level MAX a weapon class related to the element of the Map. You can cycle throughout classes by pressing the EFFECT button. You get a Bronze Tran Medal when you find a new weapon class and when you level any of them once. You get a Silver Tran Medal when you find all weapon classes; you also get a Silver Tran Medal when you raise a weapon class to MAX level. Finally, you get a Gold Tran Medal if you max out all weapon classes. Gray enemies have no weaknesses. Blue enemies are weak to Fire, therefore weak to the Fighter class. Yellow enemies are weak to Wind, therefore weak to the Archer class. Green enemies are weak to Earth, therefore weak to the Knight class. Red enemies are weak to Water, therefore weak to the Viking class. Purple enemies are weak to Holy, therefore weak to the Cleric class. White enemies are weak to Dark, therefore weak to the Assassin class. Monster - unlockable charts and pickaxes are dropped by a selection of them. Temple - new weapon classes are gathered from there. Rock - obstacles that can only be cleared with pickaxes. Pickaxes are consumed after each use and require the Knight class. Fountain - increases the Level of the currently chosen class. As of Qprogue DX, this item does not appear anymore. Dock - cross a specific body of water to reach the opposite dock. Requires the Viking class. Cave - enter to unlock a new map. Turntable - collect to obtain a song chart (i.e. NORMAL for both Single Player and Double Player). Lithography - unique items found on each Qprogue DX map. Getting all six of them unlocks Map 4-7. They also increase to Level MAX a single weapon class related to the opposite element of the Map, except for Traveler and Rainbow Knight. Charts for boss songs are dropped by unique enemies found in fixed positions. These ones have much higher HP than normal enemies, depending on which difficulty chart they hold. You're rewarded with a Bronze Tran Medal when you find any chart; the "Last Dance ANOTHER chart" Turntable item rewards you with a Silver Tran Medal; the "煉獄のエルフィリア ANOTHER chart" Turntable item rewards you with a Gold Tran Medal. NORMAL chart if the level average is less than 9. HYPER chart if the level average is less than 11. ANOTHER chart if the level average is 11 or 12. It's worth noting that the play mode is always set on Single Player in the mini-game. Also, the HI-SPEED setting is forced to 1.0 and any option/modifier cannot be used. Once you begin fighting the creature, you cannot leave the Castle until you defeat it. The objective is self-explaining: clear the chart snippet and if possible, obtain a FULL COMBO; the damage dealt to the creature depends only on your play performance. The regular groove gauge is used, with the only difference that hitting a note increases said gauge by about 10%. Afterwards, an animation of the Q-pro avatar attacking the boss is shown in the video; the creature's health gauge is displayed below the movie window. It requires just a few play sessions to deplete its health. When the creature is defeated, you unlock a new song with all of its charts and you're allowed to return to the map. Stamina points aren't obtained while fighting in the Castle but aren't consumed either. You can access this Castle after unlocking all the ANOTHER charts of Qprogue songs (CS songs are excluded). The VEFX button must be used to switch maps. If all enemies are defeated and everything is unlocked, the Qprogue event will not show up anymore. If you fully finish the Qprogue DX event, you will get a Platinum Tran Medal, 10100 Dellars and the weapon classes' items as Q-pro parts. The layout of the map forms the word "IIDX"
This map is accessible after unlocking the ANOTHER chart of ra'am. This map is accessible after unlocking Votum stellarum -Hommarju Remix- and BLUE DRAGON(雷龍Remix IIDX). Access to the Qprogue DX map is forced; if you didn't unlock the previous Qprogue songs, you'll find them in Maps DX-1, DX-2 and DX-3. 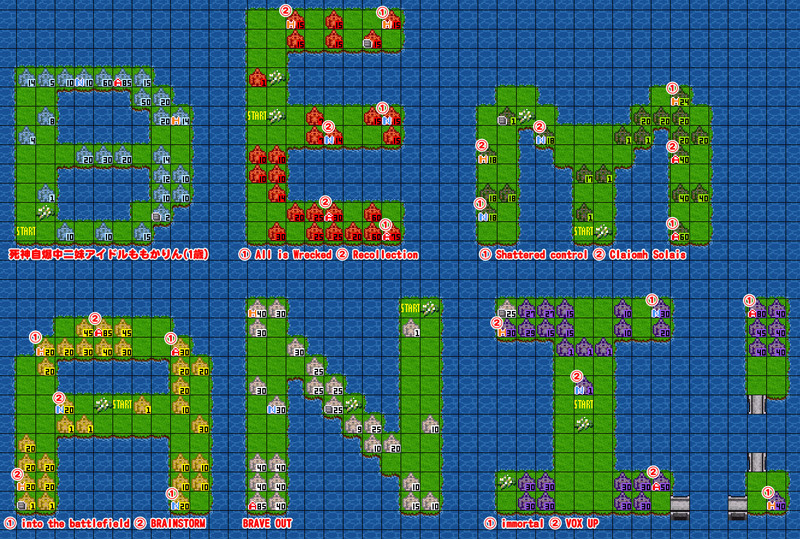 The layout of the six Qprogue DX mini-maps form the word "BEMANI!". The seventh mini-map is shaped like a sword. Claiomh Solais / DJ YOSHITAKA VS S.S.D. The SUPER STAR -MITSURU- Perfect Revival (SUPER STAR 満 -MITSURU- 完全復活祭) is a special event of beatmania IIDX 21 SPADA about the return of SUPER STAR 満 -MITSURU-, introduced on March 26th, 2014. You unlock customization items related to the artist, as well as songs. The new customization items require specific conditions to be satisfied in order to make them appear in the shop; they have all to do with 326, Japanese wordplay for "Mitsuru". Each item costs 32600 dellar, however it's not necessary to buy them in order to obtain Tran Medals or to unlock a song. Conditions can only be satisfied in STANDARD mode, except on EXTRA STAGE. It is NOT possible to satisfy more than one condition in a single credit. Clearing songs while satisfying conditions is not required. Unlocking a customization item nets you a Bronze Tran Medal. Unlocking a song nets you a Silver Tran Medal. Medal name: ONLY ONEな爆発 (Only One Explosion). Item type: note explosion effect. Unlock condition: clear a chart with 326 notes. Only I Was The One's Single Player HYPER chart has 326 notes. FULL COMBO is not required. Medal name: ONLY ONEなレーンカバー (Only One Lane Cover). Item type: lane cover frame. Unlock condition: end a song with the green number set at 326. SUDDEN+ and/or HIDDEN+ must be used. Medal name: ONLY ONEなターンテーブル (Only One Turntable). Unlock condition: play a beatmania IIDX 3rd style song as the FIRST STAGE, a beatmania IIDX 2nd style as the SECOND STAGE song and a beatmania IIDX 6th style song as the FINAL STAGE. Medal name: ONLY ONEな判定文字 (Only One Judgment Font). Item type: judge font (displays "Only One" next to judge rating). Unlock condition: play a Level 3 chart as the FIRST STAGE, a Level 2 chart as the SECOND STAGE and a Level 6 chart as the FINAL STAGE. It is possible to switch between Single Player mode or Double Player mode while satisfying the condition. Medal name: ONLY ONEなキービーム (Only One Key Beam). Item type: note beam effect. Unlock condition: at the end of a song, hold down the 2, 3 and 6 buttons until the result screen appears. When playing in Double Player mode, hold the three buttons of only one player side. Medal name: ONLY ONEな選曲BGM (Only One Song Select BGM). Unlock condition: play three songs whose BPMs sum up to 326. An example would be playing Dr.LOVE, GAMBOL and 5.1.1..
Medal name: ONLY ONEなカテゴリーボイス (Only One Category Voice). Item type: custom system voice. Unlock condition: play a song with a title beginning with the number 3 as the FIRST STAGE, a song with a title beginning with the number 2 as the SECOND STAGE and a song with a title beginning with the number 6. 3y3s is the only song which satisfies the first condition. Songs that satisfy the second condition are: 2 tribe 4 K, 22DUNK, 250bpm and 24th Century BOY. Rock Da House is the only song which satisfies the third condition. The number 6 is pronounced as "roku" in Japanese, as does the word "rock". Medal name: ONLY ONEなフルコンボ (Only One Full Combo). Item type: full combo splash effect. Unlock condition: obtain an EX SCORE of 623 points with the MIRROR modifier activated, on any song. Every day, on all SPADA machines, three songs are marked as "featured". You can see which ones are marked in the Data Entry window or in the songwheel menu. Playing all three of them in a session will grant you 300 bonus dellars. For the list of featured songs, please check the beatmania IIDX 21 SPADA Today's Featured Songs List page. The Weekly Ranking feature in beatmania IIDX 21 SPADA began December 4th, 2013. Weekly Ranking sessions last for a week, with Wednesday at 12:00 pm being the beginning and as well as the deadline in the successive week.